A good question to ask yourself is what are your beliefs about money? One thing that most of us believe is that, “I don’t have enough money.” Our beliefs about the world and our ability to earn shape the world we live in. Once you’re able to pinpoint any negative beliefs you have about yourself relating to money you’re able to see how you’ve been the source of your current monetary situation. This has been an extremely difficult thing for me, to look at my actions and realize that I’ve brought on the debt and this “lack” mentality. Initially I did a lot of blaming and shaming. I quickly realized this would not solve my money woes. I began to really look at myself and my beliefs, like “I never have enough” and “I will always struggle with finances.” Shining a light on these beliefs opened up a way for me to shift my energy and start to change at a deeper level. You can do the same thing. Once you see your beliefs clearly you suddenly have access to creating something different. You’re able to change your story thus changing the belief! Imagine if you believed at a core level “I always have enough money” or “I have endless amounts of money.” How would these beliefs affect your life? How would they affect your daily actions/behaviors? Would your life or environment look different? How do you get to a better financial situation? One way is to make a concerted and consistent effort to change your behavior. If you never save money and you always spend your whole paycheck (and it’s not all for bills) start putting a portion into savings. The changes of course will be based on your specific behaviors. Another way to start this transformation is through tapping. Tapping is allowing me to release old hurts and beliefs and it’s making it much easier for me to start putting in more positive, and uplifting thoughts into my belief system. If anything in the following script doesn’t quite fit, please change the words to ones that resonate with you. You’ll start by finding a sore spot on your chest and gently massaging the area. Take two deep breaths. The script will be centered on a fairly common feeling people have towards money “I never have enough money.” Say this statement and rate this on a scale 0-10, 0 being not true at all and 10 being extremely true. You will tap on the various pressure points I've listed or what's most comfortable to you. Head: I’m open to this possibility now. There is an abundant universe out there. If I have any thoughts or feelings that consistently pop up while tapping I will often write them down. These thoughts can be another topic for a future tapping session. It's good to have an EFT notebook where you jot down any insights, feelings or beliefs that occur to you while tapping. You can always look back through the notebook for things you may need to work on. This is the first time I've made spinach pesto, and it's phenomenal! When I first tasted it out of the blender I felt like it was missing something. I let it sit in the fridge for an hour, and then I mixed it in with some gluten free pasta. Wow! It tasted great, I thought "Man this is made with spinach!" It's considered a raw pesto if you use raw nuts. I didn't have any raw nuts on hand, but I will use raw next time. It's a really simple recipe and I hope you'll enjoy it as much as I did! You will blend all of the ingredients is a blender or food processor. I recommend having a spatula on hand so you can blend a little, push everything down, blend a little more, push ingredients down, etc. This keeps things from getting stuck to the side of the container instead of getting blended. Once you’re finished you can use it on pasta, salads, sandwiches, and whatever else you choose. It should keep 3-4 days. Yoga Spring Mala: Why Would You Do 108 Sun Salutations? This past Saturday I went to Innerlight’s Spring Mala. Innerlight is a yoga studio in RI. If you’re in the area definitely check it out. You might be asking yourself what is a Spring Mala? I know I did when I first heard about it. Basically a Spring Mala is a time when we can become aligned with nature, such as the natural awakening that occurs in the spring. Spring is a time when trees, flowers and all sorts of plants are budding and butterflies are fluttering about. This is a time when night and day are in equal balance, as light prepares to overtake dark. Days are becoming longer, brighter and warmer. 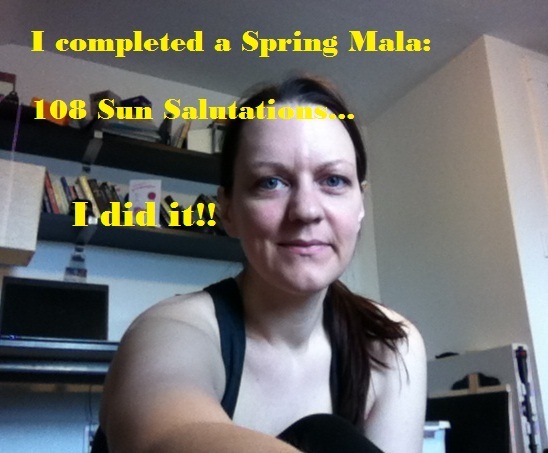 A mala is 108 sun salutations. A sun salutation is essentially saluting the sun, yet it signifies so much more than that. It’s like an awakening of your spirit, your joy, and inner light/love. Basically, you’re connecting with the sun and recognizing your oneness with it. It’s a beautiful and powerful practice. The Spring Mala was supposed to last 2 hours and ended up being close to 3, and it was so worth it! We did four sets of 27 salutations and took little, restorative breaks in between. After the initial round of 27 sun salutations I was feeling warmed up and thinking I can do another set. After the second set my shoulders began to ache and I thought I can do at least one more set. After the 3rd set my shoulders and wrists were killing me but I figured I’d made it this far so I kept going! I did take a few short breaks during the final round to sustain my poor shoulders. I am really proud of myself for staying for the entire set. I needed to do this to show myself I can do this! Also, to show myself how much self-healing I’ve actually done since December (when all my back issues started). I am falling into complete belief of my abilities to heal myself and embrace the future. For the first time I really feel like I’m running towards my future instead of away from it. This is a good feeling. Is there something you’d like to do, possibly a personal challenge you want to make? I say make it today. See it through regardless of how long it takes you or how much you may want to give up. You’re worth it!